Oh! How time does fly! Here we are in the 18th -- and last -- week of fresh vegetables from Maine CSA Wolf Pine Farm. It's been my pleasure to share a few favorite vegetable recipes each week. But vegetable recipes are a year-round affair here at A Veggie Venture (and it's not too soon to start planning for Thanksgiving vegetable recipes!) so I do hope you'll come back often. Better yet, sign up for an e-mail subscription and then new recipes (including a brand new set of Thanksgiving vegetable recipes, beginning November 1) will show up in your In Box, you'll never miss a single one! But here are this week's vegetables - your boxes are overflowing! Rutabagas - You'll find just a few rutabaga recipes but I do especially recommend the rutabaga and apple, perfect for fall! Potatoes - Oh there's nothing like just-dug potatoes! You'll find lots of recipe ideas for potatoes. If there are baking potatoes in the collection, do try my Sloooow-Baked Potatoes. Brussels Sprouts - There are plenty of Brussels sprouts recipes but do try the ones cooked with pancetta, also the wine-glazed Brussels sprouts. Apples - A bag, says Natalie. Kohlrabi - See a handful of kohlrabi recipes but my favorite "recipe" is to peel and slice (and eat!) like an apple! Carrots - A whole 5 pounds so you're going to want lots of new recipes, for sure. See all the Carrot recipes but I'd be tempted to tuck some (along with potatoes and maybe beans) into this salmon chowder. For something rich, there's the ultra-dreamy Creamy Carrot Puree. You could also do the very gorgeous Mashed Potatoes & Carrots. And I'll post a new carrot recipe on Monday that may appeal, an old Finnish recipe. Salad Greens See all the recipes using lettuce and other salad greens, plus, do you know how to make salad dressing? Cooking Greens - Here's a recipe inspired by Wolf Pine Farm, chard & chickpeas with feta. For other recipe ideas, see the Leafy Greens recipes but if you can't use the greens for a day or so, I really recommend doing a quick cook right away as in Greek Greens. Pac Choi aka Bok Choy - Check the Bok Choy recipes for ideas. Chinese cabbage - Natalie, Stephen and I have been discussing what, exactly, Chinese cabbage is and have decided it's something between Napa cabbage and bok choy; if you'd like to make a meal from it, I recommend the tropical supper salad which pairs beautifully with tropical pork tenderloin. 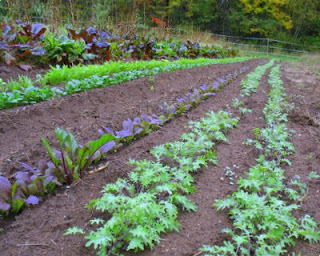 Otherwise, check the 'Chinese cabbage recipes' at Wolf Pine Farm. Cilantro - For a list of recipes using cilantro, just search on 'cilantro' in the Search box at the top. Favorites include quick appetizers made with green chutney or almond cilantro spread, veggie burritos with cilantro sauce and for a vegetable, a Mexican flavor profile from Rick Bayless, green beans with tomatillo salsa dressing. Scallions - Green onions are easy to use but there are at least one recipe where green onion is an 'essential' ingredient, quick 'n' easy side salad with Italian dressing. This is the farm I visit every summer! Tom's sister Liza is a member...it's a good place. So great that you are doing this for Amy and Tom at Wolfpine Farm! I don't live anywhere near there, but know these farmers from their student days in Boston. They are the epitome of what you wish for in a CSA. Karen & Lydia ~ You've gotta love this 'small world'! Someday I'll get to Maine, with any luck. This is so exciting for you! I saw mention of it over at Stephencooks and had to pop over. Congratulations on the new endeavor! Thanks for the great ideas! We had garlic scape pesto for dinner (I didn't follow a recipe, but your ideas were helpful), and used the snap peas in the pesto. It was great. I love checking your site every week to see what suggestions you have for the produce. PS Thanks for the encouragement of garlic scape pesto. I passed up piles and piles of scapes in May and now wish otherwise, at least for a pesto. Glad yours was good!